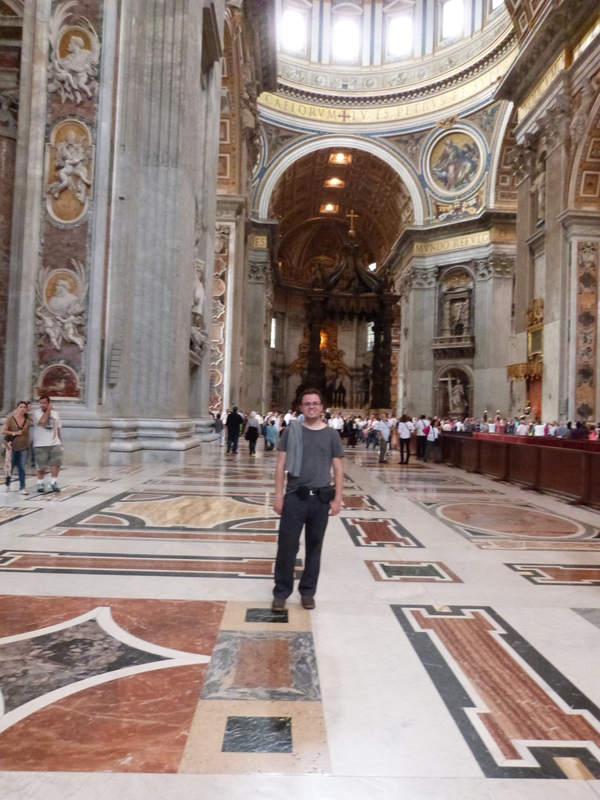 When you come down the stairs you are immediately inside St. Peter’s Basilica which is a large, lovely church. It is immense. The size of it, the height of the ceiling, the stunning displays of statues and marble and gold gilding on every wall and surface is extraordinary. 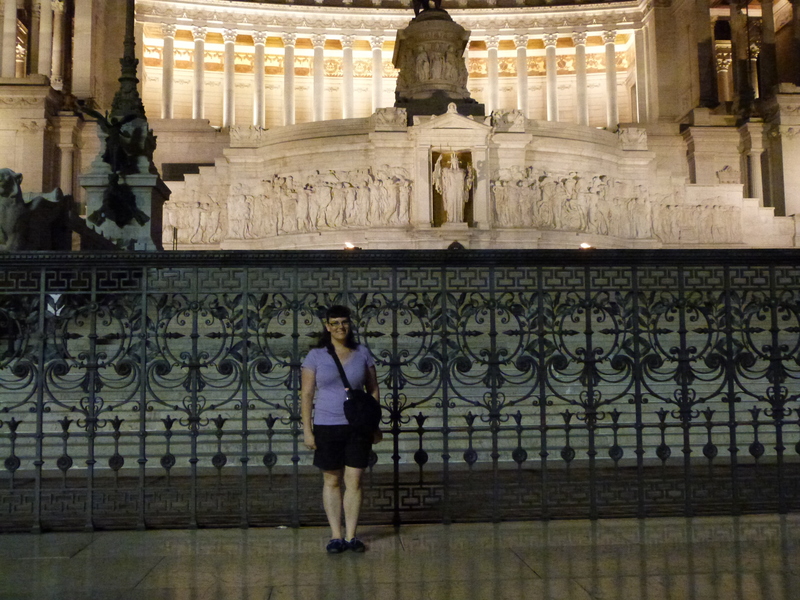 Despite us both being very hungry and tired, we had a walk around this extraordinary place and took some pictures. 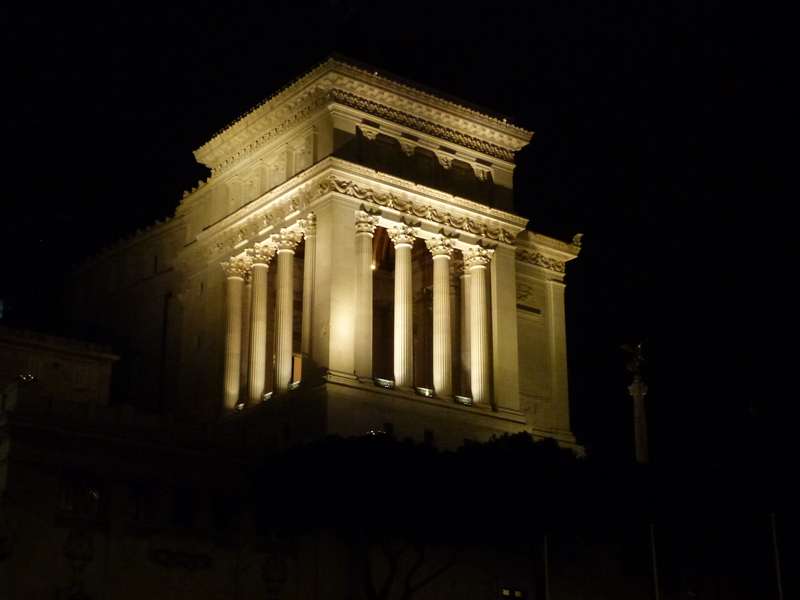 We learned later on that most of the splendor for this church was cannibalized from the ancient palaces on the Roman forum. Chris commented that this would be a great place for a fight scene. I wholeheartedly agree. 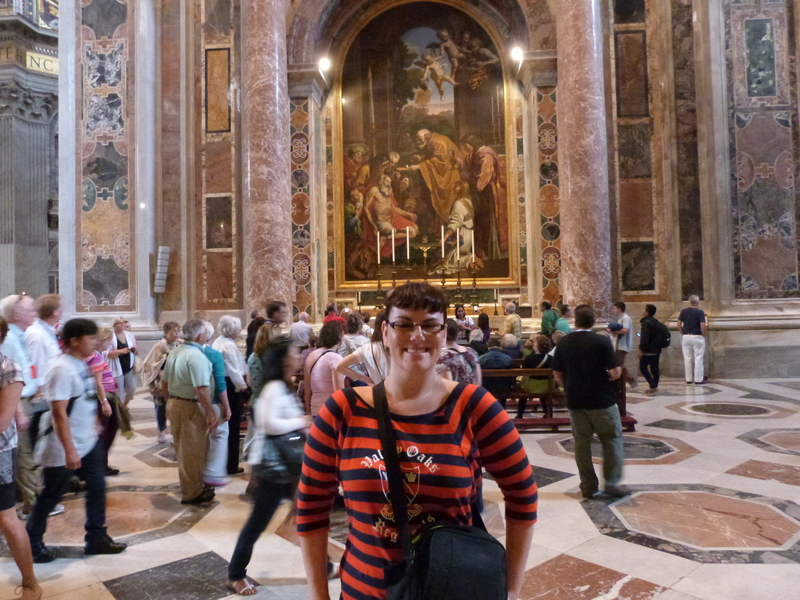 I must work in a trip to Rome for my characters and an epic battle in the Basilica! 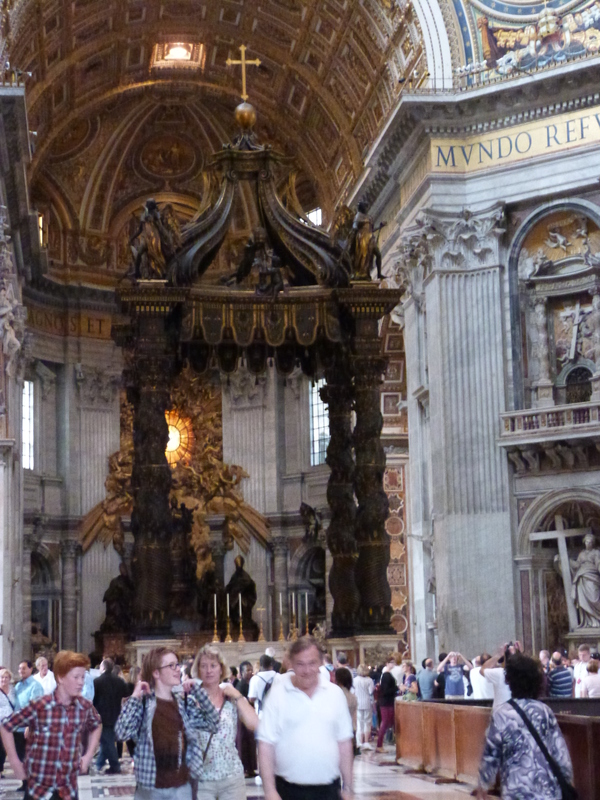 What draws the most attention is the sheer size of this enormous fixture at the back center of the church. 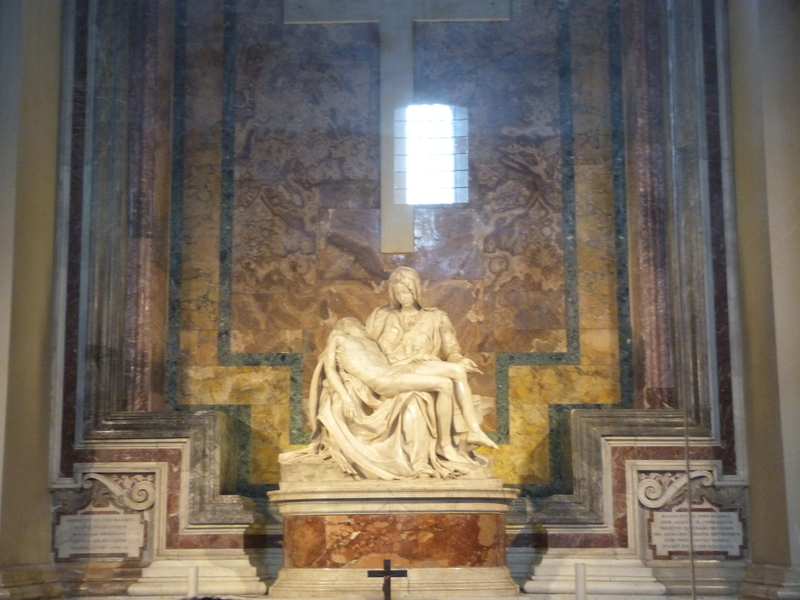 While most of the space is wide open, statues and decorations along the walls, this piece stands out. 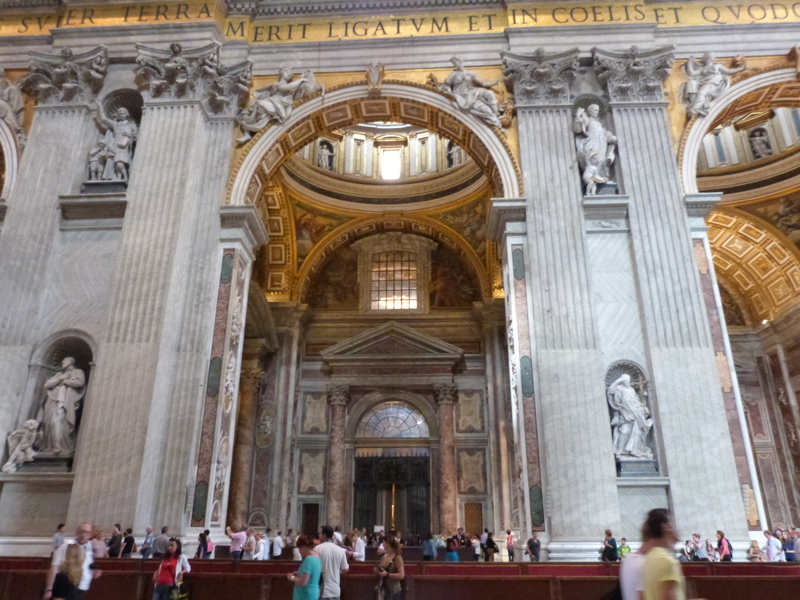 It is St. Peter’s baldachin, sculpted out of bronze by Bernini, it is 98 feet tall and sits at the center of the dome. 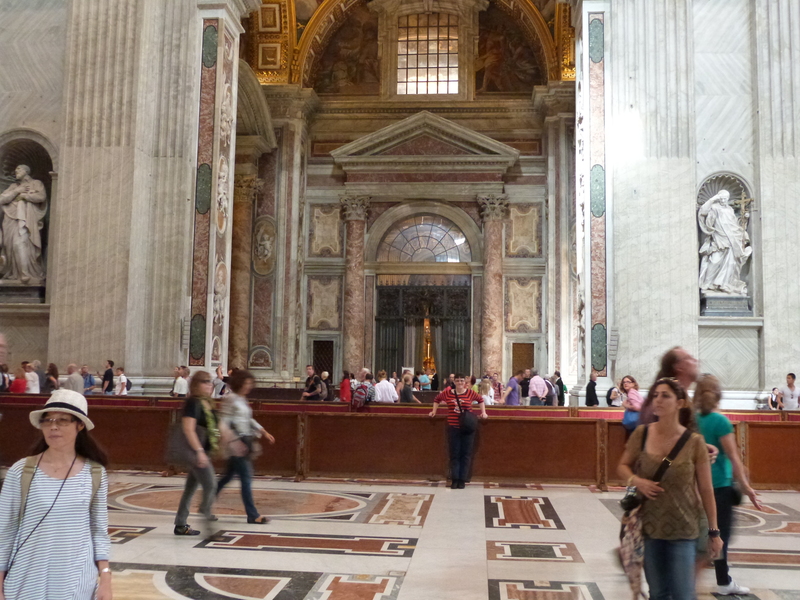 We left reluctantly, having not spent as much time as we wanted inside the Basilica church, but we were hungry and very thirsty. 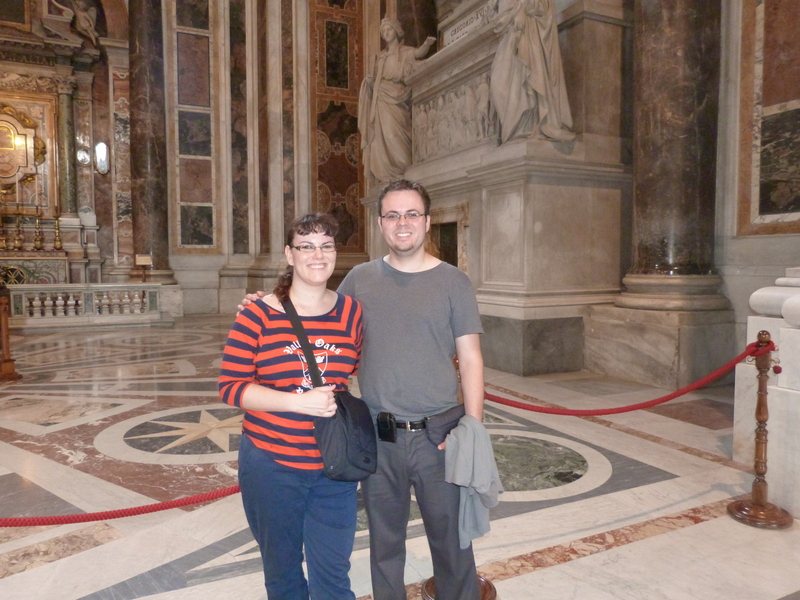 We left the Vatican and ended up where we’d started that morning, in the front of the Vatican where all the white columns stand. 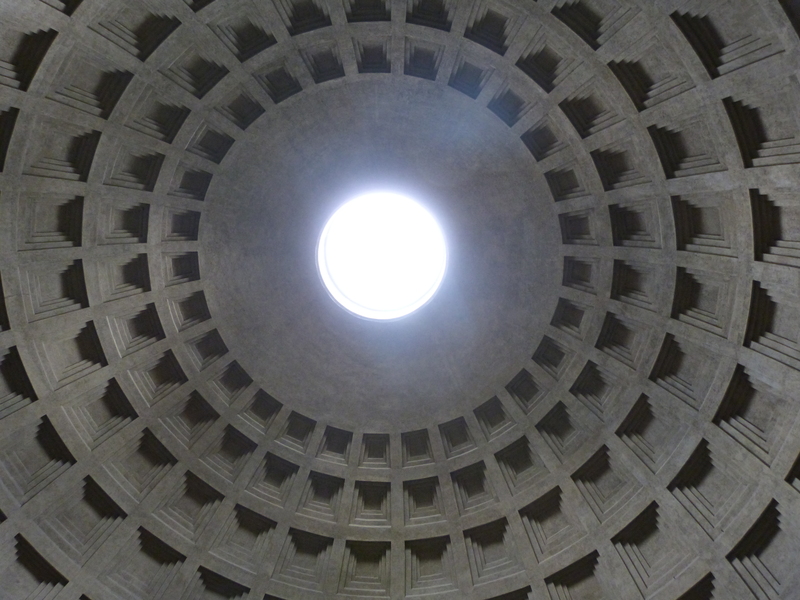 We grabbed a cab and, trying to be as efficient as possible with our small amount of time in Rome, headed for the Pantheon. 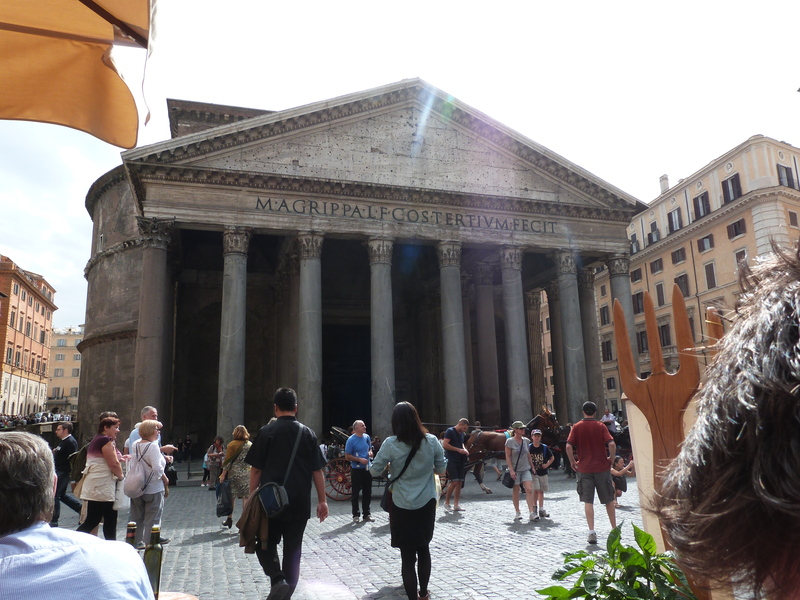 We had lunch at a restaurant in the courtyard in front of the Pantheon. 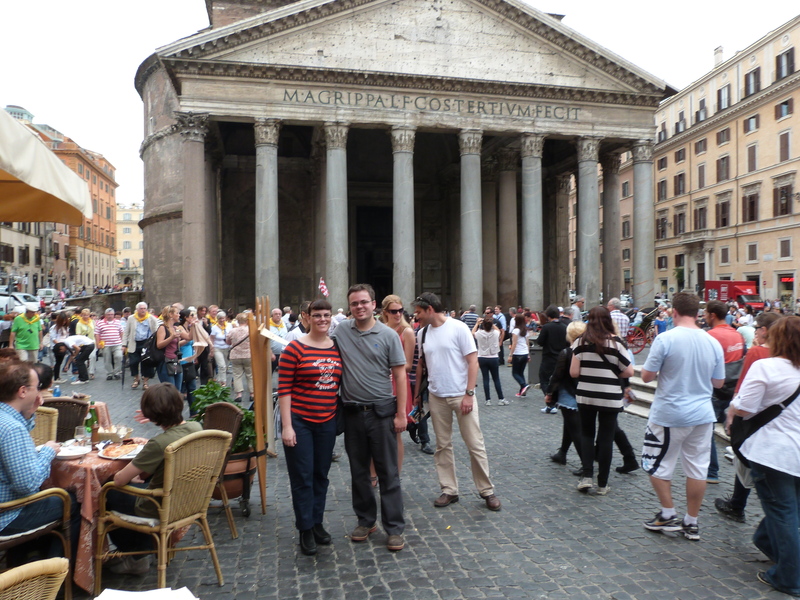 We sat outside and ate peacefully just staring at this building built in 126 AD. It is stunning, really. 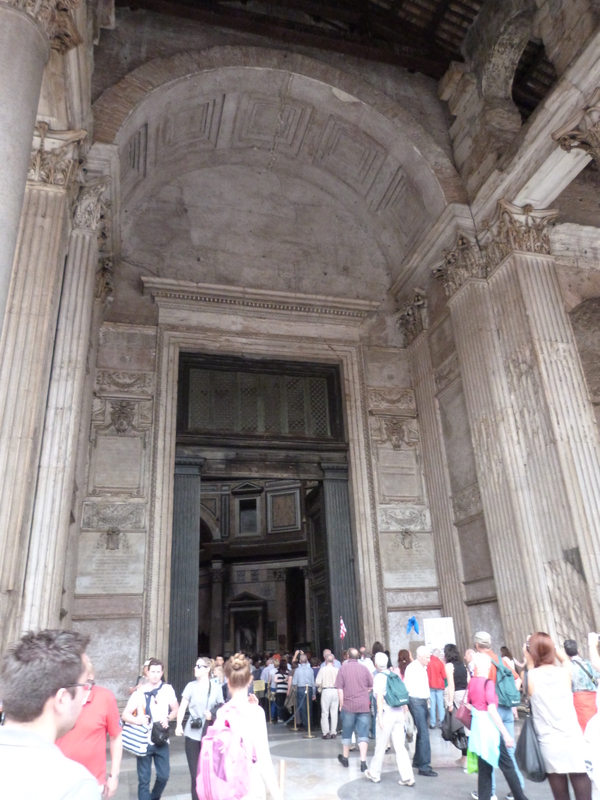 All these people mill around it, you can touch it, this huge ancient building just sitting there – it is unreal. We headed over after we ate and walked right in, no pass or ticket needed. The crowds weren’t too bad and we walked around and took pictures. 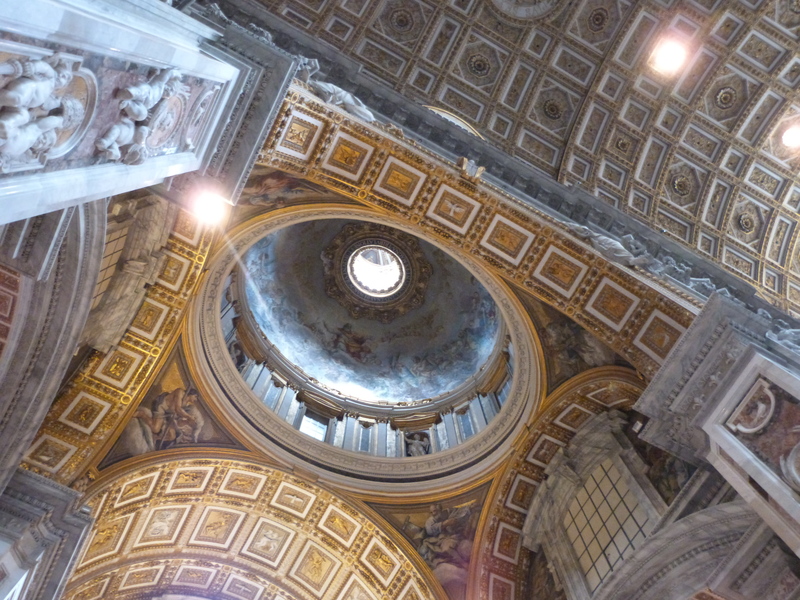 The inside is much smaller than the Basilica, it is really just a very large room with the dome at the center of the ceiling. It is very pretty. 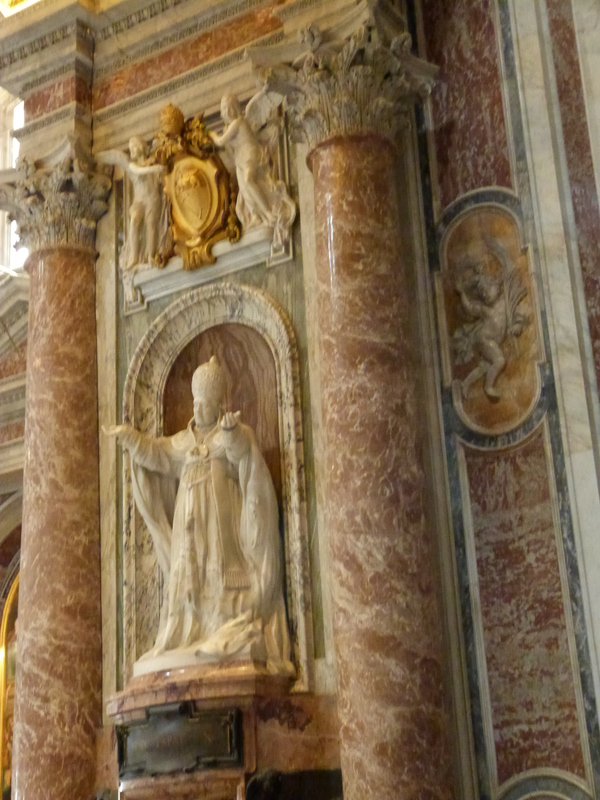 Along the walls are statues of saints. This did not take very long to see. 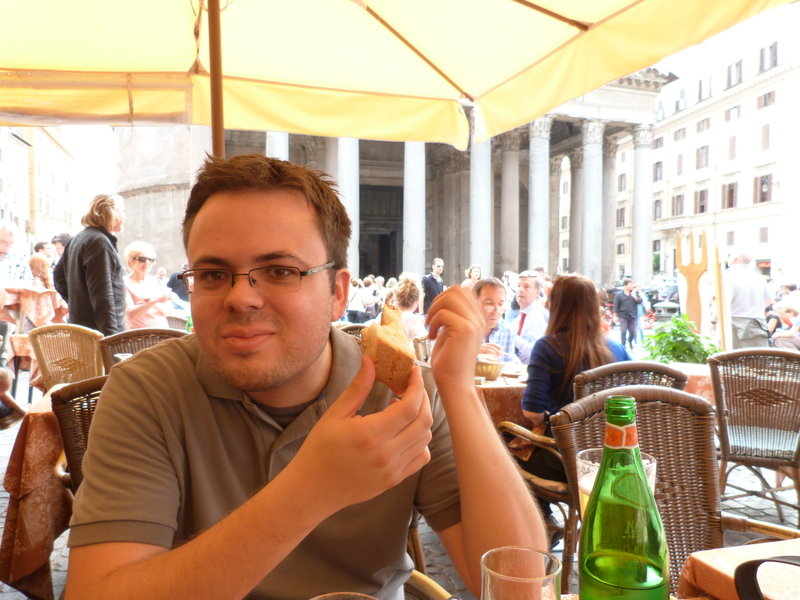 From there, we headed over to San Crispino Gelato for real Gelato ice cream, passing the Trevi Fountain again on the way. Oh, the gelato there was well worth the special trip. It was extremely tasty. 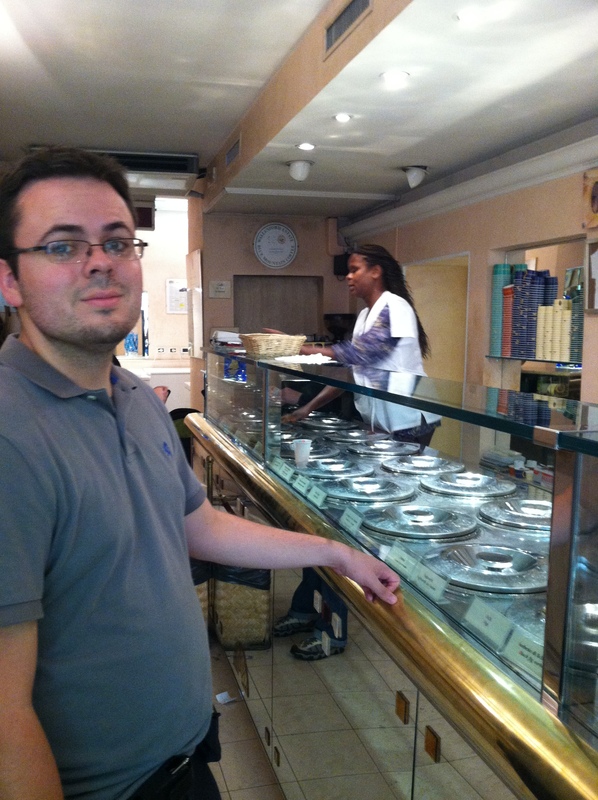 We enjoyed the gelato, but not the service. After handing over our money, the woman asked for a very large tip and tried to give us back no change. If I remember correctly, she wanted the 5 Euros in change to keep, which is insane. She got very nasty when I asked for my change back. Then I felt bad and left her a Euro anyway, which I had intended to do all along. I looked back on it afterward and thought that I probably shouldn’t have left anything when she was so nasty. It was warm out and so lots and lots of people were on the streets. 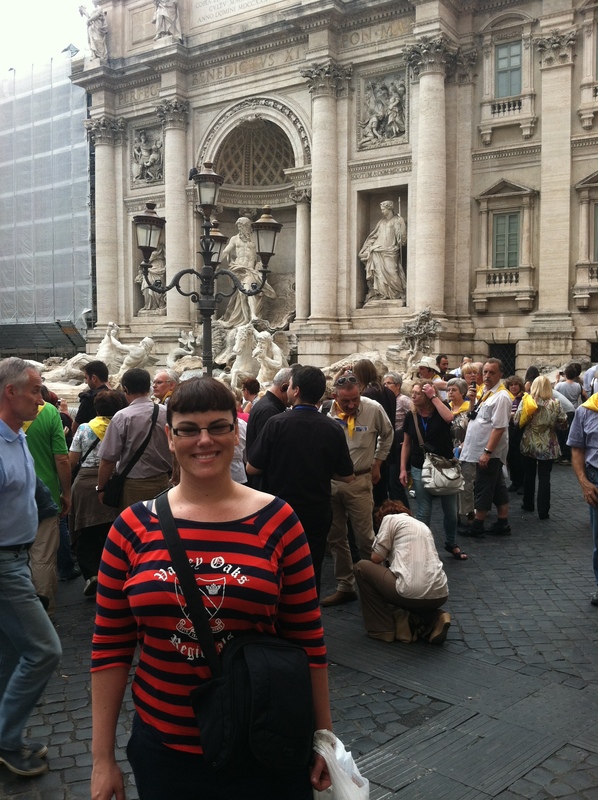 The Trevi Fountain was much more crowded than it had been the evening before. We walked around for a bit. There were artists and craft stalls all along the streets and I bought some little painted pictures of the major sites of Rome for souvenirs. We also stopped in this charming little wine shop and did our best to speak with the proprietor about which wine to get when he only spoke Italian. He was very nice and we came away quite happy with a bottle of Italian red wine. We also stopped in a cheese shop and purchased some strong parmesan cheese that the nice man vacuumed sealed for us to take home. 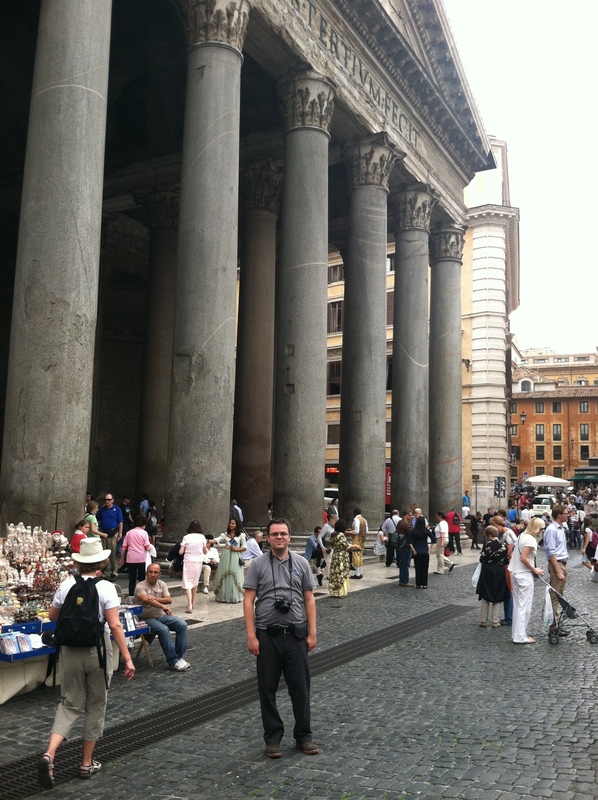 Back at the Pantheon, we found a cab and took it back to the hotel, extremely tired from the day. That evening, we were told the metro would run for a little while to get people home from work. 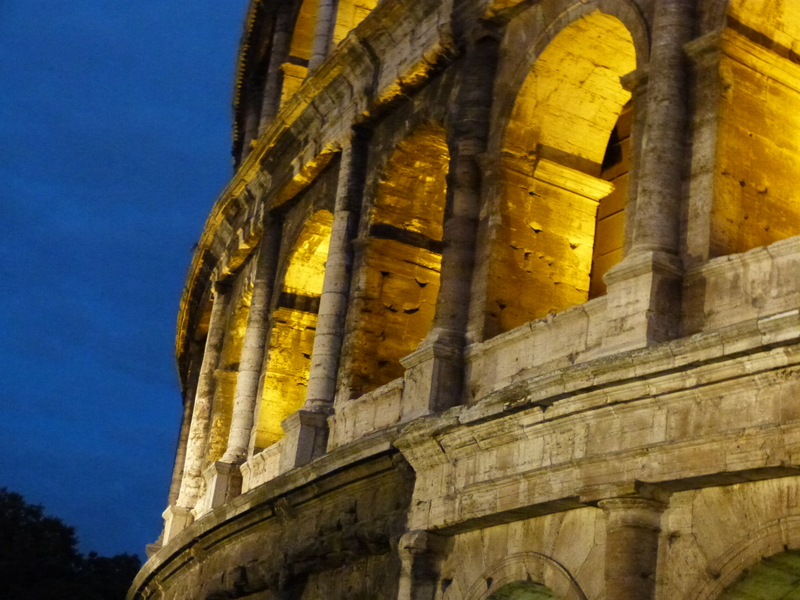 This is a very odd way of striking, but it gave us a chance to use the line and head down to the area where the Colosseum is to have dinner. Quick note on the metro, it is very easy to use and understand. The only issue someone might find is that it gets very very full, but you just crowd right in and watch your purse. We had dinner and walked around a LOT more. I didn’t think I had it in me. 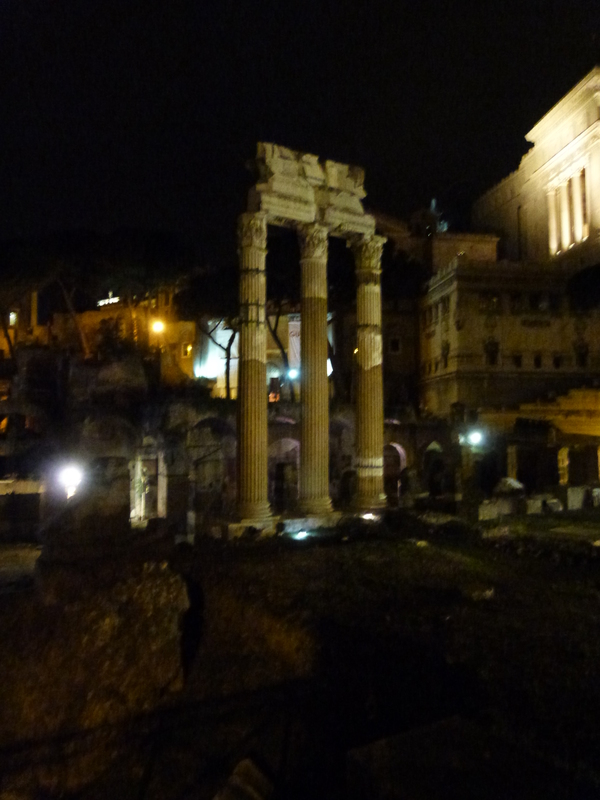 We ate near the Colosseum after it got dark and then walked down the street along the Palatine, which we could see very little of at night, towards this giant hill with this big, pure white, lit up museum at the top. 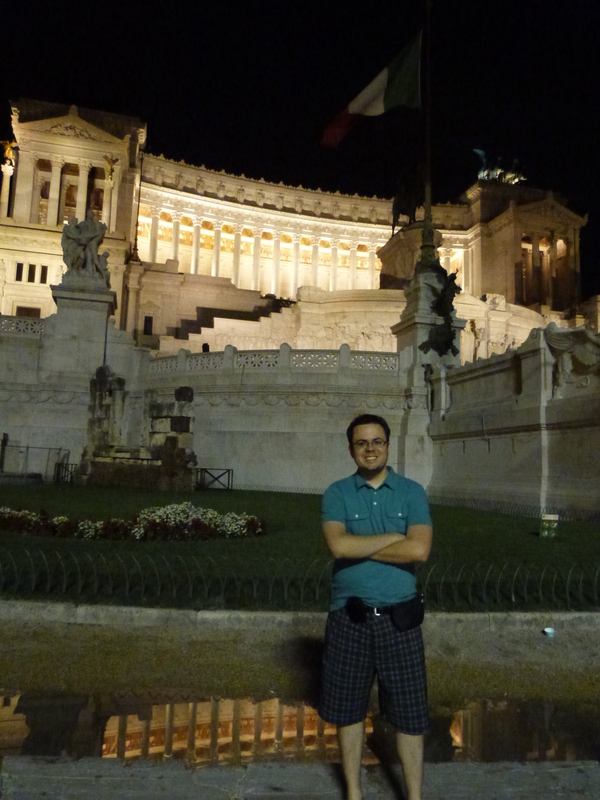 We found out later it is the National Monument to Victor Emmanuel. 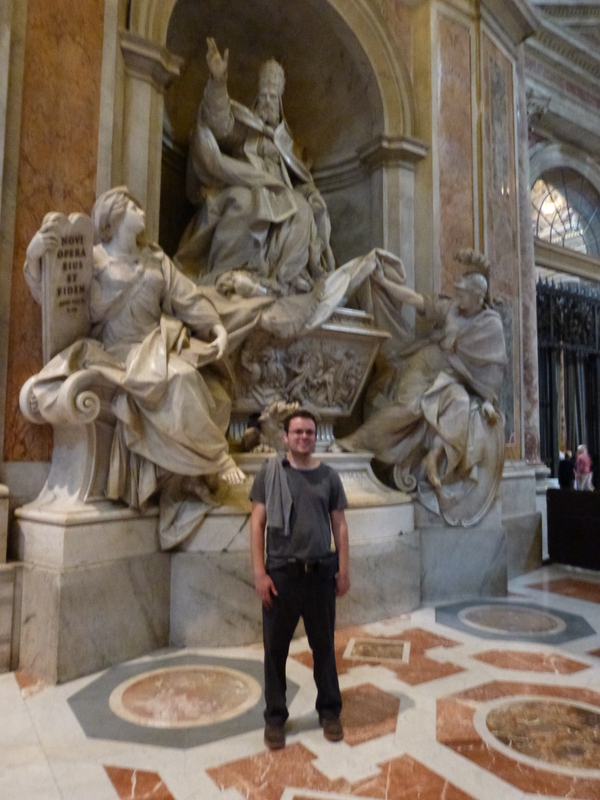 It is all white marble and extremely impressive looking. It holds their tomb of the unknown soldier, but when we asked about it later the locals don’t seem very impressed or happy with it. This is one of the many times where we should have grabbed a cab because at this point it was quite late and we’d been going and going and going all day long! I can’t remember now how Christopher convinced me to continue walking, but walk we did…all the way back to our hotel. 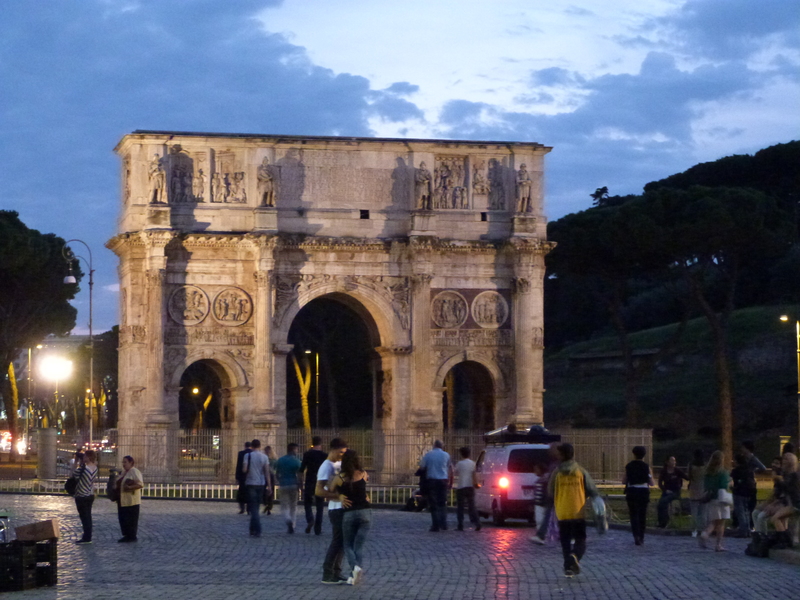 That is from the Colosseum all the way across Rome back to our hotel near the National Library, the Crosti Hotel on Via Castelfidardo. For those following along at home, that is just under 5 miles. I got some good night pictures, though. We promptly went to sleep. 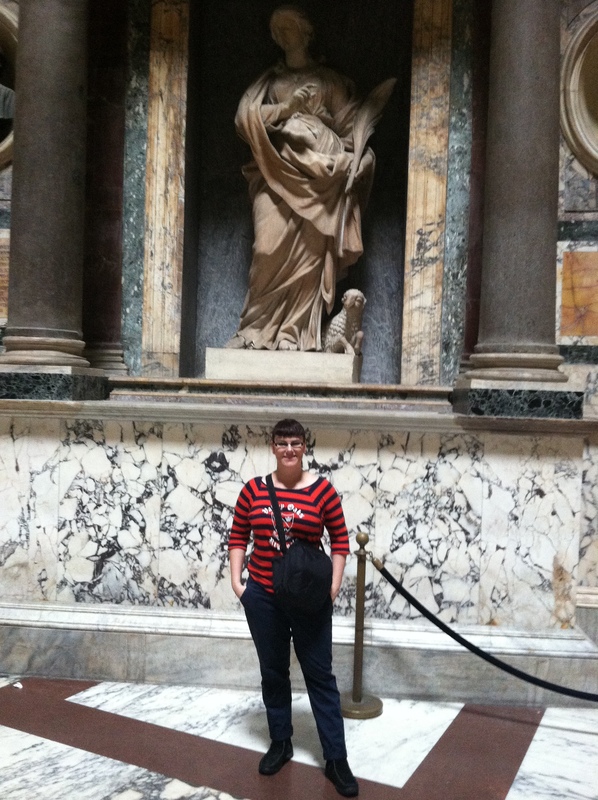 This entry was posted in Our trip to Europe and tagged book, Colosseum, Italy, Pantheon, Rome, st. peter's basilica, travel.